The Small Business Trade Show is designed to encourage the expansion of trade within the community, and reduce the level of imported products while highlighting the unique business opportunities that the local economy brings. 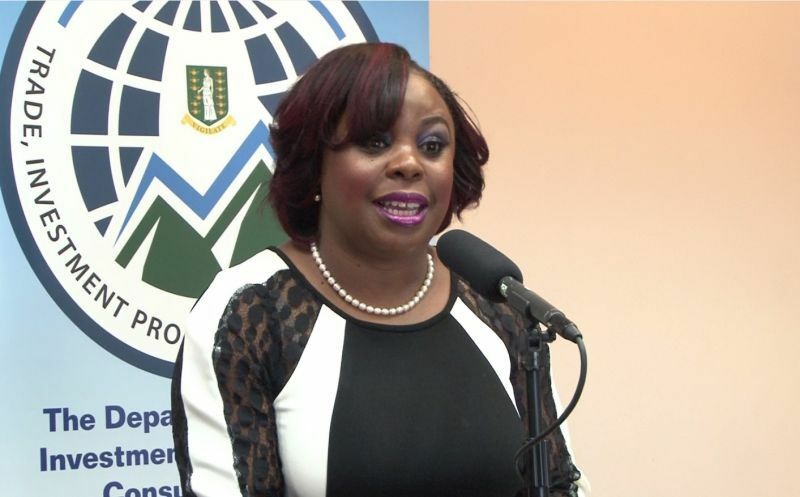 Director for the Department of Trade, Investment Promotions and Consumer Affairs, Mrs Karia J. Christopher, said that her department is seeing a substantial increase in the business and entrepreneurial sector. “Part of our job in encouraging the entrepreneurial spirit amongst our residents, is offering opportunities and introducing initiatives that assist these business owners with the right tools, skills and knowledge to be both locally and internationally competitive in this growing economy,” she said in a press release from the Department of Trade. Speaking exclusively to Virgin Islands News Online (VINO), Mrs Christopher said, “In order to be eligible, you just have to have a dream and want to learn some more about a business, the first segment will be driven towards customer service, marketing and business data,” she said. Mrs Christopher noted, that as part of helping business owners fully understand the ‘hows’ of runing an entire business, the department will be inviting industry experts to speak to participants about the basics of start-up. 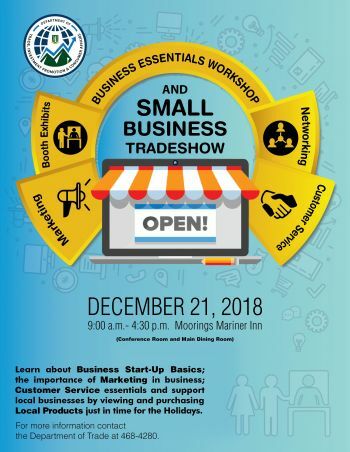 The all-day event is free of charge will be held at the Moorings Marina Inn from 9:00 a.m. through 4:30 p.m. beginning with the Business Essentials Workshop. “We want small businesses to have a venue and a space to be able to sell their products/services free of charge and we want the patrons of the BVI to understand that there is not a lot of need to go out abroad… there are lots of varieties here in the BVI, lots of people with wonderful great quality products,” she said. The workshop will focus on topics including: Getting Started as an Entrepreneur - Start-Up Basics, Selling Your Dreams (Marketing), and Customer Service Do’s and Don’ts; while the Small Business Trade Show will showcase an array of products and services that are available locally to the community. “We want to ensure that they, [Small businesses] start 2019 off with the best knowledge for them to carry forward their business,” Mrs Christopher said. Registration can be done by contacting the Department of Trade, Investment Promotion and Consumer Affairs via telephone at 468-4280 or 468-2008 or by visiting the office on the 2nd Floor of Sebastian’s Building. No more of these NDP piggybacking off all we. Don’t want to hear all you. Thats all she good for, planning events, its really her forte. They should make a special position for her....though Idk if Lorna will have any pull once Orlando is out but still, they should create a special non management role for her. Shop local keeps money local, creating a multiplier effect in economy, creating employment, growing the economy........etc. However, getting consumers to shop local is a challenge. Consumers are not necessarily loyal to shopping local; they seem to be loyal to fair and reasonable pricing, variety, quality, post purchase service........etc. Increasingly, consumers are shopping overseas, especially on line. Understanding core business fundamentals are critical for starting and staying in business. As such, hopefully this business initiative is effective in getting consumers to shop local and stay shopping local. Same old, same old this has been the same initiative year after year this Department is sad. Moreover, they conduct one follow up ‘if that’ and you never hear from them again on the subject matter. Enough is enough, how about assisting small businesses with grants in excess of $1000? The public falls for this each and every time! Exactly. Sick of this Department now. Only the “popular” small businesses are notified about their initiatives and are high on their lists for any grants and or other programmes they have geared towards helping small business. This has to stop! Nothing is really being done to help those who are struggling to help keep them in business. Also the lack of public support to local small businesses is what kills the small business, they prefer to shop by the white’s and Arab’s and Jamaica and other nationalities stores making them filthy rich while we the local business owners suffer in silence in our own country. These non BVIslanders are also favored by the politicians and our friends and families who ensure that they are well taken care of from granting of permits, breaks from importation of their goods to even handing them free money. This has to stop NOW!! Support the local small businesses and stop helping those who are already established!!! to Irate Citizen if you have the right product at the right price your business will flourish in the BVI. My friends and I are always shopping local, looking for the best quality and best price. I will not buy something for 50 dollars at your place of Business, if I can get that same product at Mr. John Doe place for less, that's just common sense.